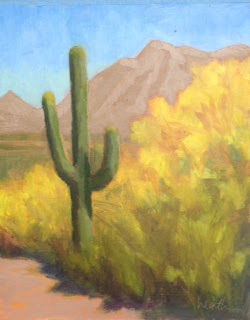 Last week I was in Arizona for the 5th annual Plein Air Convention. It was amazing to listen to and to watch fabulous painters show us how they work. Some that I particularly enjoyed were Jove Wang, Matt Smith, Paul Kratter, and Lori Putnam. Bryan Mark Taylor gave a wonderful presentation on how we learn, and how one can learn to paint better, faster. Fascinating. When circling to land, I was dismayed to see what looked like mountains made of dirt, which isn't too far from reality. But the plant life is so interesting, I didn't wish for granite rocks. We all fell in love with Saguaro Cactus. It takes 50 - 100 years for one of these guys to grow their first arm. Wow. Each day there were paint outs as well as presentations. Above are my two paintings. 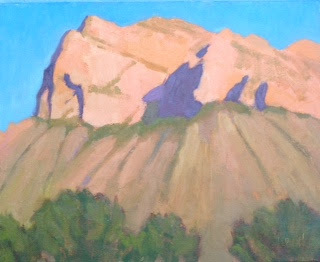 Karen Ann Hitt and Bill Anton gave me advice on the second, and the painting is better for it! Lovely combination of cools and warms! !